When roasting chicken, all anyone seems to know is the Italian method — a combination of lemon, olive oil, and herbs. It’s delicious, but why not break out and try roasting a Mexican-style chicken for a change? Smoky, brown chipotles add a unique, complex touch to the sweet and sour glaze. 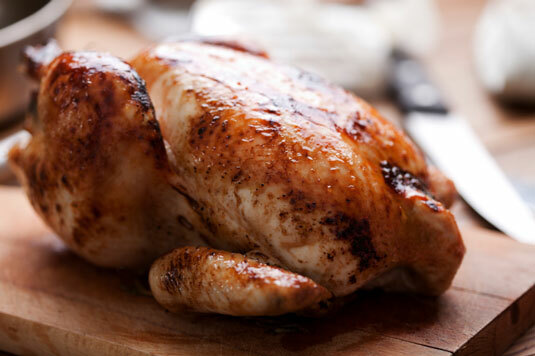 Rinse the chicken, remove any excess fat, and pat dry with paper towels. In a small bowl, mix together the garlic, salt and pepper, paprika, 3 tablespoons vinegar, and olive oil. Rub the vinegar mixture all over the chicken, including the cavity. Cover with plastic wrap and marinate, at room temperature, for 1 hour. To make the glaze, combine the orange juice, honey, 2⁄3 cup vinegar, and chiles in a small saucepan. Cook over medium heat until the liquid is reduced by half. Strain, pushing the chiles through a sieve, and reserve. Unwrap the chicken and place in a roasting pan. Roast for 15 minutes. Then reduce the heat to 375 degrees F and continue roasting for another 45 minutes. Begin brushing glaze generously all over the chicken, every 5 minutes until done, about another 20 minutes. When a leg can be loosely twisted, the chicken is done. Sprinkle with parsley, let rest 10 minutes, and serve.